The past first week of August 2010 was momentous to say the least.... Meeting Aitken Rōdaishi face to face after all these years was an incredible experience. We have communicated "mind to mind" for many years but I was never so fortunate to be in his physical presence. On July 13th, when he asked me to come and visit him in Hawaii, at first I hesitated... After talking with my son Ryushin and a couple of close friends, I decided to borrow the funds required and make the trip. While I was preparing to leave and then traveling Ryushin conducted an appeal to raise the money from supporters to enable me to make the journey. 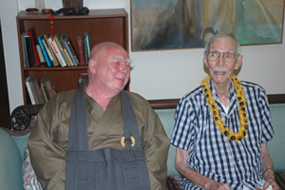 Rōdaishi and I had meetings every day I was there in Palolo except for Wednesday, the day he was taken to the hospital. I recorded all of our meetings and the audio files have been archived. On Thursday, I was scheduled to fly home. I had trepidation about leaving with him in the hospital, but was reassured by sangha members that he had been hospitalized many times before and had always responded to intravenous antibiotics. Lynn Davis, the Archive Librarian a The University of Hawaii at Mānoa, a close friend of Aitken Rōdaishi, had volunteered to drive me from the Palolo Zen Center to the Honolulu Airport. 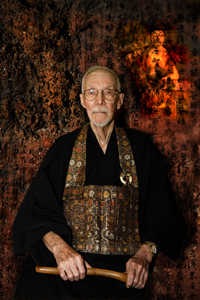 With the unexpected hospitalization of Aitken Rōdaishi, we went to the Straub Hospital so that I could say goodbye to my beloved friend, spiritual father, and colleague. I was stunned on seeing him, he was breathing heavily, his eyes were almost closed and he was unable to speak. He knew I was there, we held hands as I spoke to him. At one point he became agitated and I could tell he wanted something from me. Not being able to tell what he wanted, I just moved my head close to his chest and he placed his hands on my head, patting me to comfort my sobs on his death bed. It was heart breaking. 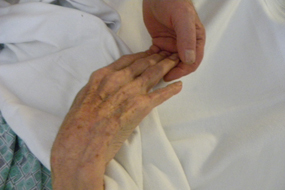 On leaving his room I burst into tears and was held by his caregiver, Mele, as I sobbed. I left the hospital troubled and began my twenty-six hour journey home. Lynn stopped at a flower shop and presented me with a traditional Hawaiian tea leaf lei "for protection." The trip home was grueling, painful and unsettling. On arriving at the bus station in Bangor, Maine on Friday at 6:45 PM, I saw my son Ryushin and our dog Harley waiting for me through the bus window. I got off the bus and greeted, first Harley, and then Ryushin. I sensed that something was not right and as I embraced my son he gently told me, "Aitken has passed." I burst into tears and wailed in front of the crowd, I sobbed uncontrollably as my son held me in his arms. I felt as if my heart had been torn out. I had time to compose myself on our hour and a half ride home. 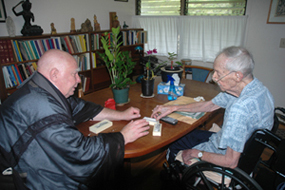 As soon as we got in, I called Michael Kieran, of the Palolo Zen Center, and Tom Aiken, Rōdaishi's son and expressed my condolences.